Comicsgate Is a Nightmare Tearing Comics Fandom Apart — So What Happens Next? I believe comics are for everyone. There is no excuse for harassment. There is no place for homophobia, transphobia, racism or misogyny in comics criticism. And so on and so on and so on and so on and so on. There is no place for homophobia, transphobia, racism or misogyny in comics. I believe comics are for everyone. There is no excuse for harassment. There is no place for homophobia, transphobia, racism or misogyny in comics. Et cetera, et cetera. What the hell was happening? The answer involved one proper noun, often masked with asterisks or euphemisms to elide searchability: Comicsgate. As one might suspect from the name, Comicsgate is, roughly speaking, Gamergate for comics. Like that infamous mass movement of angry gamers — which, it’s been convincingly argued, was a key component in the stunning rise of the alt-right and the election of Donald Trump — Comicsgate is a loose confederation of tweeters and YouTubers who make it their business to yell about how much they hate the “social justice warriors” who are, in their eyes, ruining their favorite medium with leftist politics. Unlike Gamergate, the participants in Comicsgate didn’t choose their name — it was lobbed at them by their opponents. Nevertheless, the shoe fits, and many of the angry readers within the movement have embraced it. Other reporters have chronicled the origins and development of Comicsgate in great detail. There have been terrific pieces by Rachel Krishna at BuzzFeed, Asher Elbein at the Daily Beast, Melissa Morgue at Capeless Crusader, and Eric Francisco at Inverse, and they’re all well worth your time if you care about the current state of the comics ecosystem and/or online discourse in general. But a brief summary is in order. It’s hard to pinpoint exactly where Comicsgate began. Perhaps it was presaged by the 2014 defenses of artist Milo Manara’s highly sexualized Spider-Woman cover. Maybe it was the aborted attempt at a Gamergate-style push in 2015 when progressives denounced a Batgirl cover depicting misogynist violence, and right-leaning folks (including, bizarrely enough, Milo Yiannopoulos) denounced the denouncers. Or possibly it was when feminist writer Chelsea Cain was bullied off of Twitter in 2016. However, one can also argue that the groundwork was laid by changing structural factors in the geek-media ecosystem. The comics critic David Uzumeri wrote a fascinating Medium post Sunday night which argues that, as he puts it, “when existing power structures denigrate and question the integrity of a free and fair press, it opens a hole for an unfair press to seep in.” In his estimation, the so-called Big Two comics publishers, Marvel and DC, have been trending toward an adversarial relationship with sites and individuals who were critical of them. As a result, thoughtful critics left the game and the gap left behind was filled by increasingly low-rent sites. The bar for quality discourse dropped so low that even a slapdash hate campaign could start to look like the rest of what passed for mainstream comics criticism. The fire was fed when creators started getting into petty fights with readers on social media — most notably in the debacle that was Captain America writer Nick Spencer’s battle with his critics — and fan responses to things they didn’t like became ever more vicious. Then, in April of 2017, while the Spencer fight was reaching a fever pitch, a Marvel executive named David Gabriel gave an interview in which he seemed to say the company’s push for greater diversity in its character lineup might have led to reduced sales (an argument that is much disputed). Enter Richard C. Meyer, an Army veteran and former PayPal employee who started railing against such diversity on Twitter and YouTube under the username “Diversity & Comics.” He began to gain a following, but it wasn’t until the milkshake incident that things really heated up. In July of 2017, famed old-school Marvel staffer and underground-comics maven Flo Steinberg died. In her honor, a group of female Marvel employees gathered a few days later to drink milkshakes and celebrate Steinberg’s legacy, and one of them, assistant editor Heather Antos, took a group selfie. For whatever reason, this was a supremely provocative act for a gaggle of misogynists, who railed against the much-retweeted image. The women within it were treated to the usual Gamergate epithets — “social-justice warrior,” “virtue-signaler,” “fake geek girl,” and the like — and the chorus of fury got louder. Comics pros and fans rallied in Antos’s defense with a #MakeMineMilkshake hashtag, but a seal had been broken. Since then, there’s been a growing tidal wave of reactionary hatred directed toward women and minorities in the comics world. 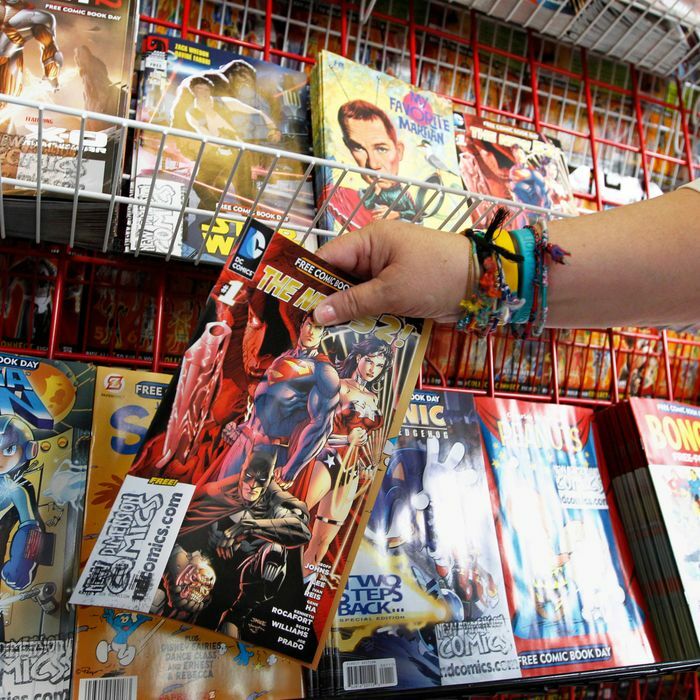 In angry tweets, as well as rambling YouTube videos, members of the inchoate Comicsgate movement have derided female and minority characters, creators, and fans — all while claiming to want a return to an imagined past of apolitical comics. Many of them have special ire for trans people (“SJW Mags Visaggio Takes Advantage of Trans-Tender [sic] PRIVILEGE To Get Hired And Make Money,” reads the title of one Meyer video about trans writer Magdalene Visaggio), accusing them of faking their trans status for fame and profit. A Comicsgate news-hub called Bounding Into Comics emerged, where progressive creators and critics are regularly accused of harassing or silencing conservatives. For those who followed Gamergate, the defensive positions are all too familiar: whenever someone says something extreme or incites targeted harassment, other reactionaries will either say it was all a joke or that that person doesn’t represent the larger movement. It’s nearly impossible to win an argument with the Comicsgaters, but ignoring them (something I’m ashamed to admit I thought would work) isn’t doing the trick, either. For months, the mainstream comics industry was largely silent about all of this. Indeed, Meyer was arguably surpassed in his status as the most prominent member of Comicsgate by the successful penciler Ethan Van Sciver, who continued to be employed by DC even as he befriended members of the alt-right mob online. (Van Sciver’s role is hard to parse, in that he doesn’t exactly incite harassment, but is often accused of dog-whistling for it and has arguably legitimized a lot of Comicsgate voices by interacting with them in a friendly way. He has also posted in the main pro-Trump subreddit and made weird jokes about Nazism.) The higher-ups at the Big Two and the most famous creators who worked for them remained, by and large, silent while progressive fans and critics did the dirty work of battling online. However, the tide seemed to turn when Comicsgate went after a widow. Darwyn Cooke, one of the greatest writer/artists of modern comics, died in 2016, leaving behind a wife, Marsha. About a week ago, a Comicsgate-affiliated Twitter user who goes by @GromComix tweeted that Darwyn “would have been #ComicsGate” and an infuriated Marsha replied to him, “Hi guys, this is Darwyn’s wife and I can guarantee he thought you comics gate idiots were a bunch of crybaby losers ruining comics, because you are.” All hell broke loose. Comicsgaters started harassing Marsha and, for whatever reason, insulting Visaggio. Marsha kept pushing back, eventually telling Van Sciver that his “friends are being transphobic,” to which Van Sciver responded that she should just mute them. Progressives were enraged at his perceived callousness and refusal to denounce the harassing users, and yet another, wider wildfire about Comicsgate spread throughout Comics Twitter. The difference this time was that an extremely successful comics professional stood up to be counted among the anti-Comicsgate crowd. Just before midnight on Wednesday, Jeff Lemire tweeted, “Comicsgate is based on fear, intolerance, bigotry and anger. The comics creators emerging today are too talented, too smart and too loud to be beaten by these weak people. It’s time we all started standing up for one another.” Retweets and likes flooded in. The next day, legendary artist Bill Sienkiewicz followed suit with a long Facebook post about his hatred of Comicsgate. Little by little, more and more creators took a stand. It all culminated in Taylor’s aforementioned and much-copied Twitter manifesto on Sunday, which was echoed by dozens upon dozens of writers and editors. There was criticism from the left about the fact that Taylor and those inspired by him had called Comicsgate “comics criticism,” rather than outright harassment, and Taylor apologized and clarified his view. So, where do we go from here? “ComicsGate Won’t Be Defeated by Well-Intentioned Tweets Alone,” reads the headline on an un-bylined editorial that Paste published on Monday. As the concluding paragraph puts it, “[N]ow it’s time for the most visible and secure voices in the industry to begin the hard work of listening to and uplifting those of us most at risk.” That’s absolutely true. But even support from publishers for marginalized communities won’t really be enough to stop Comicsgate and make the Comics Internet safer. I hate to end on a sour note, but I’m not sure what can put the genie back in the bottle. Surely, Marvel and DC and their smaller competitors should take a public stand and say bigotry and harassment should stop. But then what? Won’t that further embolden and harden the stances of the Comicsgaters, given that their whole rhetorical motivation comes from the fact that they think the industry caters to progressives? I fear that Comicsgate will operate like any supervillain in comics: No matter how many times you punch it, it’ll never stay dead. But that doesn’t mean the good guys get to stop fighting. follow friday Yesterday at 2:21 p.m.
this week in rap Yesterday at 2:11 p.m.
this! is! jeopardy! Yesterday at 2:11 p.m.